Habit: Plant +- strigose to canescent or +- silky-hairy. Stem: < 2 m; branches often ascending, tips not thorn-like. Leaf: +- linear to lance-linear. Flower: buds ovate, +- curved; sepals magenta; flag petals +- yellow to green at base, triangular, green and magenta, with +- purple marks above or not; glandular petals magenta with unequal glandular blisters on distal edge abaxially. Fruit: cordate, +- flat. Synonyms: Krameria glandulosa Rose & Painter; Krameria parvifolia Benth. ; Krameria parvifolia var. imparata J.F. Macbr. 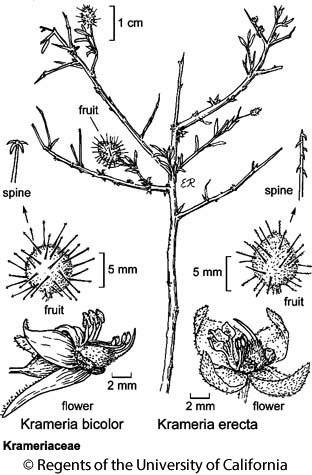 Citation for this treatment: Beryl B. Simpson 2012, Krameria erecta, in Jepson Flora Project (eds.) Jepson eFlora, http://ucjeps.berkeley.edu/eflora/eflora_display.php?tid=30007, accessed on April 23, 2019.
e PR (Santa Rosa Mtns), D; Markers link to CCH specimen records. Yellow markers indicate records that may provide evidence for eFlora range revision or may have georeferencing or identification issues. Purple markers indicate specimens collected from a garden, greenhouse, or other non-wild location.